These 36 lectures are the perfect introduction to the basics of modern and contemporary Western approaches to the philosophies of both reality (metaphysics) and knowledge (epistemology), right through the end of the 20th century. Led by Professor Cahoone, you'll partake in an engaging intellectual journey that encompasses prominent figures from all the major traditions of Western philosophy. You'll explore the ideas behind modern philosophy's most important movements, including dualism, rationalism, empiricism, idealism, existentialism, and postmodernism. You'll plunge into the thought of some of philosophy's most important thinkers, including Descartes, Locke, Spinoza, Hume, Kant, Hegel, Peirce, Nietzsche, James, Wittgenstein, Heidegger, Rorty, and Derrida, learning how many of them were in fact considered radicals, their views appreciated far less in their own era than in later ones. And you'll gain a clear sense of how each of these movements and thinkers fits into philosophy's broader progression, often pushing philosophy in dramatically new directions right up to the present day, as well as how philosophy is intimately related to a multitude of other disciplines. This is perhaps one of the best, if not the best, way of going through that much material in this short amount of time. Dr. Cahoone's ability to speak both for thesis and antithesis simultaneously is absolutely brilliant. During the last two lectures, I found his almost magical synthesis of all major views barely short of a miracle. Thank you everyone who made this happen! i am still listening, but it is a tough dlog. Lecturer skips anything normal people admire about these philosophers. I am not a student of philosophy.but have read a number of books about them. This series is not at all inspiring. I majored in philosophy many years ago and have kept up with it on an enthuisiast's level since then. However, I truly learned more from this set of lectures than I have from any other source. I think I finally understand the morass that is 20th century philosophical thought. Professor Cahoone is an exceptional teacher - lucid, knowledgable without being verbose, thoughtful and serious. Without a doubt the best Great Course I've audited. This is by far one of the best lectures I've ever heard. I'm not a philosopher. I avoided thinking most of my life. I made a mistake about a year ago and read Heidegger's "Being and Time". That completely hooked me. Now, I just have to understand our universe and our place in it. What is the order within the universe, what is our purpose and why are we here ('the three big questions"). These (or some variation of these) are the three questions that drive me and makes me want to stay alive. As for my reason for being it is to learn as much about the world as I can and this lecture series does that for me better than almost any book or Great Course has. The professor makes the point that he is only going to look at the Modern Philosophers who added to the field by adding on or subtracting from the other philosophers who came before them and thought differently from the others. This lecture series is a constant exchange of ideas from brilliant thinkers from across a 400 year dialog among respectful friends who all had a unique perspective of some kind to add to the discussion. He covered Heidegger over two lectures. He gave the best graphic I've come across in order to explain him (it's available on the attached pdf and I would recommend grabbing it while you can). He makes the point that Heidegger starts with things (Being) but will ultimately end with time (past, present, and future) as if he really all along meant to start with time. Cool stuff. He does start the lecture series with Aristotle and the scholastic school of thought. The great battle that constantly roams the hallways of the world is the conflict between the sophisticated sophists and their putting humans as the "measure of all things" and the absolutist who have their universal, necessary and certain view point of the world. There is no right answer. The world is underdetermined. The facts we have are always adequately explainable by multiple theories. See his lecture on William Van Orman Quine for further explication. The world is determined by our biological, historical and current context. The weight we impute to those three determine how we see the world. The focus of the lecture series is not the "philosophy of science", but those concepts lurk with in this lecture series. I really loved this lecture series and would strongly recommend it to anyone, but be prepared to be overwhelmed by all the great thinkers covered and to be inspired to read some of the primary sources cited in this series. One needs to start some where with learning critical thinking and understanding why we are here, what our purpose is and what is the order (ontology, foundation, archetypes, forms, ideals, pick your favorite substitute for 'order') of the universe. I'd even say that if one can master the ideas presented with in this lecture series (which I have not and know I'll have to listen to it multiple times before I even start to understand) one will be able to understand the "three big questions" and realize how most of what surrounds us is crap and only acts as a distraction against what our authentic selves should be learning and understanding. Our greatest virtue is our higher thought. Our distractions are necessary because we must survive, get along with others and enjoy life, but we should only use those distractions in order to re energize ourselves and learn to enjoy life more fully. This professor is very good at explaining complicated ideas. Yes, complicated ideas are still complicated when they are explained as best as they can be and I won't lie sometimes I would get lost. Though, don't let that stand in the way of trying this lecture series. (I had bought the audible before I had signed up for the reasonably priced Great Course Plus on line with video. I watched this course instead of listened to it. So technically this review is for the video version not the audio version. I'm glad I watched it instead of just listen to it. There were many visuals and the Professor did an incredibly good job with hand motions, facial expressions and the like. This is one of the few audible courses or book where I got a lot more out of it by watching instead of just listening. Let that be a warning and a recommendation to sign up to The Great Courses). 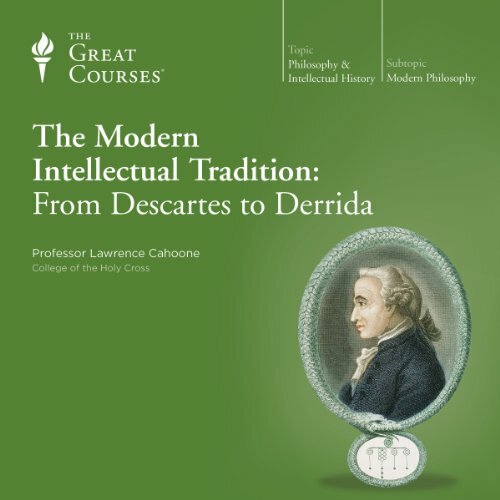 What did you love best about The Modern Intellectual Tradition: From Descartes to Derrida? The depth of understanding Prof Cahoone conveys throughout the lectures. His love of the subject was expressed brilliantly and yet dispassionately. As the series was so enjoyable, I plan to listen to the whole series again. On the whole, I thought this was a worthwhile course. Although I was familiar with most of the philosophers and philosophical movements covered in the course, I got introduced to some I had not heard much about before. His summary of Hegel is particularly excellent, since Hegel is notoriously hard to summarize. However, I admit to being rather disappointed by the lecturer's aside about "Foucault's exploration of sexuality - which he also explored in his personal life, and died of AIDS". I found this unnecessary and subtly homophobic. Furthermore, it had the effect of subtly eroding the potential validity, or objectivity of this theorist's work. It was a little thing. But when I heard it, it disappointed me and forced me to question the objectivity of many of the lecturer's earlier assertions on philosophers I knew less about. The idea of the Great Courses series is great. Record good professors lecturing on their best subjects and absorb what you missed (or didn’t take) in college. Most of the Great Courses series have notes and reading lists, but I think I am probably like most and ignore the attachments. I have a lousy philosophy background. And while, audio only is probably not the best format for learning philosophy, I keep picking up Great Courses. The Modern Intellectual Tradition from Descarte to Derrida was challenging. There is a ton of content and change in philosophy over the past couple hundred years. While the presentation was good, I missed more than I understood I think. There were 36 half hour lectures. I understood a lot of basic ideas, but not a lot of the names associated with the ideas. It is fascinating to know where where different ideas originate from. It is going to take another run at the content to place the names and dates and history associated with the philosophy. The presentation was mostly historical, which biases an understanding of the progress of philosophy. But that historical presentation helped put some of the development in historical context, even if there was not a lot of history context given in the lectures. For the price (I picked up a number of Great Courses during a buy one get one free sale, which made them just under $5 a course), it is hard to beat. Interesting material if a bit dense and difficult to understand at times though I attribute this more to the source material rather the lecturer. Overall, great series and look forward to more from this professor. Professor Cahoone did an excellent job of reviewing modern analytic, continental, and pragmatic philosophy. And uniquely in my experience he didn't exhibit any obvious bias in his presentation of the widely varying views in these traditions and was actually able to illustrate some similarities, e.g. a convergence in the late 20th century towards a pragmatic view by a number of thinkers from different strains of philosophy. The discussion of the re- emergence of emergence via complexity at various levels of organization was, I thought, particularly well done. I would highly recommend this course to anyone who wants to better understand current discussions in philosophy. Far more comprehensive than expected; Thank you! This program surpassed my expectations, the most memorable part was the walk through Kierkegaard's dilemma, and the speaker was fantastic. if you've ever wanted to get up to speed on the conversation of philosophy and have a basic grasp on the history prior to descartes then youre in for a treat. I was gripped from the first to the last lecture. Enjoy! Prof. Cahoone’s mastery of the work of an incredible range of philosophers is amazing. He presents their work clearly, giving each the fairest, most complete airing the time constraints allow and connecting what comes next to what came before so the listener can follow the many lines of thought. A pro makes what’s difficult seem easy, and Prof. Cahoone by this measure is a real pro. The subject isn't easy. Should we accept Enlightment, Modernism, Post - Modernism, none of these? Well, listen to the course and decide for yourself!